Peppan -- Peppin -- Papin -- Pippin -- Pippen -- Cardonnet -- DeLafond -- DesCardonnets -- Lachance -- Lachaussée -- Laforce -- Refort -- Tranchemontagne . . . mostly. Pépins come in all sizes, shapes, and spellings, the first two because of a genetic zest for life, the latter for a myriad of reasons, the least of which was how census takers and immigration officials heard it pronounced. For the most part, the surname Pépin finds its origins in France and Normandy, though if you spell it PIPPIN and PIPPEN, you might also want to look at Great Britain unless you're certain your name started out as PEPIN. As for those of us in North America who can trace our origins back to France and/or Normandy, it's been said that we can thank one of three Pepin men for our existence: Guillaume, Antoine, and Robert. However, I discovered two more Pepin men who were raising families right along side Guillaume, Antoine, and Robert: Etienne Pepin, Sieur De Lafond and Antoine-Philippe Pepin dit Refort. Each came to Québec during the 1600s, when it was a French colony called New France, and raised families despite the political upheavals of the 1700s. On the right is a map of the first fort in Three-Rivers -- or Trois-Rivières -- and the distribution of the lots within the fort, courtesy of my friend and maybe-cousin Bill Descoteaux. Bill and I met when we were driving taxi cab for north Seattle's North End Taxi, and though we've both gone on to bigger and better things, we still stay in touch. Bill found this map posted on a Descoteaux website and sent it along because it mentions a Pepin (Guillaume, in fact), adding that, "It originally came from the book "Le Terrier du St-Laurent" by Marcel Trudel. As their families grew, some of them got itchy feet. Some headed to neighbouring provinces. Some followed the rivers south from Québec, settling in numerous places along the Missouri and Mississippi Rivers. Some signed on with the fur companies and disappeared into The West. Some went to the eastern seaboard of North America. Some stayed in Québec. They scattered, north, south, east, and west, but wherever they went, they left their mark in one way or another; Lake Pepin in Wisconsin is just one example. As they scattered, contact with the families left behind became sporadic, or completely nonexistent. So now, here we are with the year 2001 rapidly approaching. There are Pepins everywhere. Type PEPIN into your favorite search engine; I was amazed at the number of Pepins involved with the sciences, and not too surprised at the number of stunt men. A sharp mind and the willingness to take risks are two traits I'm certain our five little history-makers had or else they'd have never set foot on the waterfront, never mind climbing aboard a sailing ship to go to a newly founded colony in the unpredictable wilds of North America. However, it sorta looks like Antoine-Philippe didn't have a whole lot of choice about it; Soldat is French for Soldier. With the increasing popularity of genealogy, we are discovering family connections among our email correspondents and through the many genealogy bulletin boards scattered across the web. I don't know about you, but I'm kinda curious to see how many of us there really are. Our first stop is the first North American generation of each line. DO be aware: The information presented here comes from the Tanguay. There is much discussion on the accuracy of Father Cyprien Tanguay's work -- as I put this page together I discovered a more than a few errors -- but it's a dandy place to start. A recommendation is to compare the information found in the Tanguay with that found in the René Jetté, the Red Drouin, and the Blue Drouin, and any old Roman Catholic parish records you can find. Public libraries are a good place to look for these other works. Also, check in your Yellow Pages, under Churches, for Church of Jesus Christ of Latter-Day Saints to find out if there's one of their Family History Centers near you. I have one near me, in Mountlake Terrace, Washington, that has the René Jetté, plus a number of provincial birth, marriage, and death records, and a delightful book called Our French-Canadian Ancestors by Thomas J. Laforest, in which I found a biography for Robert Pepin, all on microfiche. If your local family history center doesn't have any of these, they can order it in for you for a nominal fee. However, if you don't have a LDS family history center handy, you can find the Tanguay online at http://www2.biblinat.gouv.qc.ca/numtextes/at802.htm in Tome 1: PAILLIER - YVELIN and Tome 6: PÉCAUDY - POIRIAU; Tome is French for Volume. This URL is from my bookmark file, it'll take you right to the page with the Tanguay on it. If your French is as bad as mine, you'll want to know that it's the section with all the little images of open books, numbered 1 through 7. This looks like a good spot for a disclaimer. The following information probably is not as accurate as it could be, but it is presented here to offer a starting point for my fellow genealogists who are having a tough time with their genealogical research and nothing more. If you know for a fact that any of the following is incorrect, drop me an email and tell me about it. My most heartfelt thanks to L'Abbot Cyprien Tanguay, Best Bill Flemming, Dwight Hébert, Chris Pepin, Gilles Pepin, cousins Andrew, Chuck, Des, Gerry, Gloria, Jackie, Jan, Jeanet, Jeannette, Jim, Jim & Cheryl, Joan, Karyl, Kevin, Laurette, Marcel, Marcella, Nicole, Nicole, Pat, Perry, Richie, Sharon, Shirley, and Terri, and all my other cousins on MetisGen and Québec, not only for their parts in gathering the information on this page, but the other Pepin pages, too. And a quick but important note: Not too long ago I learned that in the old records written in French, the B stands for baptized and the S stands for buried. When I first did this page, I had misinterpreted the B for birth and S for died, but now the following has been adjusted according to my new knowledge. 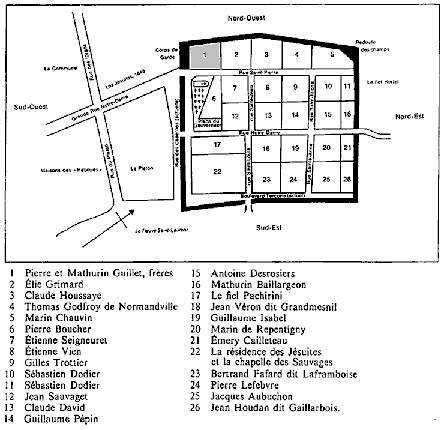 Guillaume was baptised in 1607, in St. Laurent de la Bavière, évêché de Xaintes, and buried on August 12th, 1697, in Trois Rivièrés. He married Jeanne MÉCHIN, born 1630. 1. Jacques, baptised April 14, 1646. He married Marie-Jeanne CAIET on November 16, 1671. He was buried April 10, 1715, at Champlain. 2. Jean, baptised in August of 1647. He married Madeleine LOISEAU on November 23, 1683 in Boucherville. Jean's dit name is DesCardonnets. 3. Marie, baptised April 21 1649. She married Gilles/Guillaume LA RUE on October 3, 1663. 5. Pierre, baptised December 29, 1652. He married Louise LE MIRE on October 20, 1681 in Québec. He was buried died April 2, 1722, at Trois-Rivières. Pierre's dit name is LaForce. 6. Etienne, baptised April 14, 1654. 7. Jeanne, baptised March 28, 1656. She married twice. First to Jean HÉROU on February 6, 1674; second to Mathurin MARAIS on August 13, 1690. 8. Madeleine, baptised November 19, 1657. She married François ROUSSEL on April 7, 1671. She was buried July 8, 1722. 9. Elizabeth, baptised 1659. She married Jean ARCOUET dit LAJEUNNESSE on November 16, 1671. She was buried December 31, 1697, in Champlain. 12. Marguerite, baptised May 6, 1662. She married Bernard JOACHIM on November 14, 1679. 13. Marie-Ursule, baptised May 6, 1662. She married twice. First to Nicolas GEOFFROY, no date listed; second to Louis PINARD on November 30, 1680. "Syndic des Trois-Rivières, puis juge de la seigneurie de Champlain. Il était déjà établi aux Trois-Rivières in 1684 à l'endroit où se trouve aujourd'hui la communauté des Dames Ursulines. Il est un des ancêtres de l'Honorable Hector Langevin." Etienne was baptised in 1615; buried Septmeber 15 1665, at Trois-Rivières. He married Marie BOUCHER, on January 30, 1645, in Québec. Marie, the daughter of Gaspard BOUCHER, was baptised in 1630 and buried November 30, 1706 in Batiscan. 1. Marie-Françoise, baptised October 25, 1646. She married Charles LeSieur, Sieur de la Pierre. "M. Etienne Pepin obtint un fief d'une demie lieue, dont une moitié au haut, et 'autre moitié au bas de la rivière de la Madeleine. -- Registres des Insinuations, page 119. -- Registre des Titres." Antoine was baptised in 1632, the son of André PEPIN and Jeanne DE BOURVILLE, de la ville du Hàvre. He was buried on January 23, 1703, at Ste. Famille. On November 11, 1659, Antoine married Marie TESTU. Marie, daughter of Jean TESTU and Louise TALONNEAU, of La Rochelle, was baptised in 1632, and buried September 11, 1701. 1. Igance, baptised Sept 16, 1660, in Québec. He married twice. First to Madeleine GAULIN on January 27, 1687; second to Marie LEFORT, on August 3, 1689, at St-François, I.O. Igance was buried February 14, 1716 in St. François, I.O. Ignace's dit name is Lachance. Footnote for Marie Lefort reads: "Elle épouse, le 10 nov. 1718, Joseph Deblois, à St-François, I.O." 2. Isabelle, baptised February 16, 1662 at Château-Richer. She married Olivier GAGNÉ on November 8, 1679. 3. Jean, baptised April 3, 1664 at Château-Richer. He married twice. First to Renée GUYON on October 25, 1688; second to Madeleine FONTAINE on October 30, 1703, at St-Jean, I.O. Jean's dit name is Lachance. 4. Antoine, baptised February 12, 1666. 5. Jacques, baptised September 4, 1667. 6. Marie, baptised March 26, 1670. She married Jean GUYON on October 25, 1688. 8. Antoine-Charles/Gervais, baptised November 8, 1674/1676. He married Madeleine FORTIER. Antoine-Charles/Gervais' dit name is Lachance. 9. Joseph, baptised August 8, 1679, at Cap St. Ignace. He married Marguerite FONTAINE. Joseph was buried January 25, 1721, at St-Jean, I.O. Joseph's dit name is Lachance. Footnote for Marguerite Fontaine reads: "Elle épouse, le 29 nov. 1721, Barthélemi Terrien, à St-Jean, I.O." 10. Paul, baptised August 8, 1679, at Cap-St-Ignace. He married Agnès MIGNERON in 1702. Paul was buried April 21, 1749, à St-Thomas. 11. Jean, baptised date unknown. Married Madeleine FONTAINE on October 30, 1703. 12. Geneviève, baptised September 11, 1682. She married Ambroise MIGNERON on August 8, 1703. A footnote on Antoine and Marie's date of marriage reads: "Date du contrat de mariage. -- Greffe d'Audouard." Robert is the son of Jean PEPIN and Jeanne DUMONT, of Grisy, évêché de Sées; date of burial unknown. On November 4, 1670, Robert married Marie CRÈTE in Québec. Marie is the daughter of Jean CRÈTE. 1. Jacques, baptised 1674. He was buried February 9, 1691. 2. Jean, baptised September 11, 1675. He married Marguerite MOREAU on October 10, 1695. Jean was buried December 31, 1752, in Charlesbourg. Jean and Marguerite are my 6th great grandparents. 3. Robert, baptised 1677. He married twice. First to Elizabeth BOYER/ROYER on November 16, 1700, in St. Jean, I.O; second to Marie-Anne DELASSE, on September 15, 1715, in Montréal. Robert was buried May 12, 1754, in Ste-Geneviève, M.
Footnote for Robert reads: "Fermier de M. Maricour," Footnote for Marie-Anne Delasse reads: "Lafleur; elle épouse le 21 février 1757, Jean Dany, à Ste-Geneviève, M."
4. François, baptised February 25, 1680. He was buried December 12, 1680. 5. François, baptised January 5, 1682, He buried November 3, 1684. 6. Marie-Rosalie, baptised June 3, 1664. She married Pierre ELIE on July 5, 1700. 7. Louis, baptised February 13, 1686. He married Elizabeth BOUTIN, on November 17, 1710, in Lorette. A footnote for Marie reads: "Elle épouse, le 21 avril 1687, Jean BRIDAULT, à Québec." And as I was going through the Pepin pages, I found a surprise. In and amongst the 4th and 5th generations of Pepins, there appears a first generation listing for a fellow named . . .
Antoine-Phillipe married Marie-Agathe EMERY on February 6, 1758, in St-Ours. Joseph-Marie, born October 22, 1758. A footnote for Antoine-Philippe reads:"Soldat de Guyenne." A footnote for Marie-Agathe reads: "Voy. Codere." At the big library in Salt Lake City, I was gathering more info for our Pepin cousins so I thought I would check out that mysterious Antoine. According to two books that I found, marriage indexes, Antoine's last name was Philippoin dit Befort. In these same books where listed two of his sons, with the same name and some grandchildren. By the way, M. Agthe's father is my 7th Great-Grand Uncle I did get a photo copy of this page, not to good copy but readable, from 1st book. 2. Marie-Geneviève, born December 30, 1777. Has anyone been counting . . . ? Unless I've been sitting in front of the computer and have burnt out my last two brain cells, that's a total of 35 kids from 5 sets of parents. Out of those 35 kids, there were 26 marriages . . . and a bunch more kids. The PEPIN Association web site deals primarily with the descendants of Guillaume Pepin, but also has some info on our other guys. One of the cooler features of this site is that there's a French version AND an English version. Lachance Family at www.lachancefamily.com, deals primarily with the descendants of André Pépin, father of Antoine Pépin dit Lachance. This site is also in both French and English, though Therese is still working on the English version of some of the pages. Great site, with links to other sites pertaining to the Pepin dit Lachance line. PEPPIN Tani Borger-Pratt's website. She only has one PEPPIN name, Evelyn, and she would like to know where Evelyn came from. A java site. Pepin Pepin Peppin Peppan Pappan Regardless how it's spelled, if you have a Pepin website and would like to have a link to it added HERE, drop me some email, and we'll get it done. If you have requested a link and don't see it here, please remind me.